Scientists from Dickinson College, Pennsylvania, have found that boa constrictors halt squeezing a prey when their victim’s heart stops. Scientists discovered boas can actually “feel” their victim’s heartbeat after a series of experiments. First they used dead rats with implanted “simulated hearts” (water-filled bulbs connected to a pump) to lure the snakes. When the boas struck out at the rats the scientists controlled their fake hearts remotely. They also measured the pressure of the squeeze on the rat’s bodies to see whether the snake adjusted according to heartbeat strength. When scientists kept the hearts pumping, they found the snakes clung onto the rats for “longer than any previous observation of a snake constricting a prey item – live or dead”. “I couldn’t believe my eyes the first time we tested a snake with a rat with a simulated heart,” lead researcher, Dr. Scott Boback, from Dickinson College, told BBC Nature. The team then tried the same experiment with live rats. 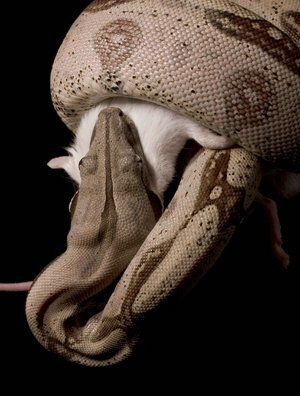 The scientists found the boas constricted the rats and then gradually eased off as their prey’s heartbeat dwindled. “There was such a clear difference I knew we were discovering something interesting,” Dr. Scott Boback said. In a summary of the study, published in the Royal Society journal Biology Letters, the scientists wrote: “Many of us think of snakes as audacious killers, incapable of the complex functions we typically reserve for <<higher>> vertebrates. The scientists added the snakes’ sense of touch may mean the serpents are “capable of things that we did not realize before”. “For instance, snakes may utilize this acute tactile sense to coordinate complex movements associated with limbless locomotion,” said Dr. Scott Boback.